In the midst of a cross Canada tour, NHL Alumni member Peter Ing and the Canadian Tire NHL Junior Skills Competition arrived in Ottawa on November 25th at the Nepean Sportsplex. The Canadian Tire NHL Junior Skills events are open to children from the ages of 7 to 12 and provide the opportunity for the participants to test their skills in four events - shooting accuracy, passing accuracy, timed skating and puck control. Using the innovative XHockeyProducts from Peter’s company, Fan-tastic Sports, (www.fan-tasticsports.com) the young hockey players are able to track their scores online and see how they compare with other young Canadian hockey players. Those with the best scores in the qualifying events from each city will be invited to Ottawa during the NHL’s All-Star weekend to compete in the grand finale. With stops in 15 Canadian cities, the events will have brought Peter from Vancouver (on October 7th) all the way to St. John’s, Newfoundland (on December 16th) and everywhere in between. At each tour stop, a number of local NHL Alumni members have joined Peter on the ice, interacting with the kids, guiding them through the various challenges and offering encouragement to all. When I stopped by the rink to catch up with Peter in Ottawa, it was interesting to see that the smiles were not only on the faces of the youngsters participating, the Alumni members were having a great time too. Joining Peter at this stop on the tour were fellow NHL Alumni members Laurie Boschman, Shaun Van Allen, Tom Fergus and Patrick Lalime. An event like the Canadian Tire NHL Junior Skills Competition ties right in with the NHL Alumni Association’s mission of growing the game of hockey at all levels. For the former NHL players involved with the Alumni Association, there is nothing better than working with young hockey players and helping to build memories that will last a lifetime. After crossing the country, the tour will return to Ottawa for the grand finale, which will take place on the ice of the world-famous Rideau Canal during the NHL All-Star festivities at the end of January. Along with wrapping up the Junior Skills competition, Peter and Fan-tastic Sports will be providing the interactive equipment for the NHL Fan-Fair at Ottawa's newly built, state of the art, downtown convention centre. The dedication to innovative ideas and all the hard work done by Peter, his partners and colleagues at Fan-tastic Sports, has made the company a leader in the industry. It is a tremendous achievement to be recognized by the NHL and a company like Canadian Tire to run the Junior Skills events and the All-Star Fan-Fair. 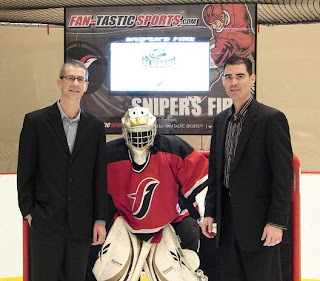 Once the Canadian Tire NHL Junior Skills Competition wraps up on December 16th, Peter and his colleagues at Fan-tastic Sports may be ready for a well-deserved rest, but it will not be too long before the calendar turns to 2012 and they return to Ottawa for more fun on the ice. After attending a Junior Skills event in person, seeing every child smiling and every parent beaming with pride, I think it is safe to say that everyone that took part in the event went home with a memory that will indeed last a lifetime. Congratulations to Peter and everyone at Fan-tastic Sports and Canadian Tire on a job well done!